Imagine being able to RIDE exactly how you want. Imagine being able to SIT exactly how you want. How do you want to ride? What vision do you have of where you want your riding to go in the future? Imagine training your horse YOURSELF. And doing it well. Imagine the feeling of riding the movements or exercises which currently elude you. Imagine the feeling of the relationship you would have with your horse. the depth of that relationship which occurs you as you are able to find a way to work with your horse that he understands and even enjoys. A way that makes sense to him, makes him feel good, and makes him eager for the next ride. Imagine really UNDERSTANDING the training. Having a clear strategy, having the tools to get there, and being ABLE to do it. Yourself. Imagine being able to understand the biomechanics of the horse’s body, the biomechanics of your body, and how those two work together. And imagine being able to not just know it in your head but to make use of it WHILE riding your horse. Imagine knowing how to find the root cause of a problem, pick the appropriate exercise that will help, and know how to change what you are doing to make it easier or better for the horse. And imagine having a trusted guide along the way. Someone who can break everything down simply, introduce it to you in a way that makes sense to you, and help you incorporate it into your day-to-day riding. Imagine having someone you can call upon when you need help and they will help you find the tools you need to find the answers to your problems. Imagine actually learning to fix your own problems yourself. And imagine having the emotional support of someone who has been on this journey before you, gets how frustrating it can be at times, but also can remind you how wonderful it can be. Someone who celebrates your triumphs, those lightbulb moments, when they occur. Is that your current reality? Or... Are you frustrated? Confused. Daunted by the long road ahead and not having any idea how to get through your current challenges? Not sure if you will even ever get "there". Do you keep doing the same thing over and over, hoping to get better results? Hoping that over time, eventually what you are doing will actually help. Is progress slow and laborious? I need to tell you... It’s not your fault. Not at all. You are likely doing the very BEST you can with the resources you have had available to you. (It's not a secret...) Learning to ride can be HARD. And the hard TRUTH is that much of dressage is way more complicated than it needs to be. It doesn’t explain or break things down in a way that makes sense for either the student OR the horse, and it seems there is a constant stream of mystery ahead of how you are going to get from here to “there”... wherever there is. The traditional way of teaching (the way we ORIGINALLY learned, too!) is really not set up so that the horse or rider will succeed. That is perhaps a shocking thing to say, but it is true. Trainers who ride well themselves often don’t teach well (of course, there are exceptions, thank goodness). Others may teach and communicate quite well, but they can only teach what they themselves were taught, so they may pass down the misinformation, confusion, and lack of clarity to their students which they themselves learned. Others regard their students with disdain. Or the horses with disdain. Or both. It is common in dressage, unfortunately. But it does not have to be that way. There can be another way. A heart-centered, compassionate method based on straight-forward biomechanics of horse and rider. I’d like to finally introduce ourselves to you. We are Shana and Thomas Ritter. We live in Germany where we work with riders of all skill levels, all disciplines, and all types of horses. We have taught throughout USA, Canada, Germany, Austria, The Netherlands, and Switzerland. We have published two books on dressage, one based on biomechanics and the other about the work on the longrein. Our next soon-to-be released book is a systematic process to train the Flying Changes. And now we teach online courses empowering everyday riders like YOU to train your horse - yourself. 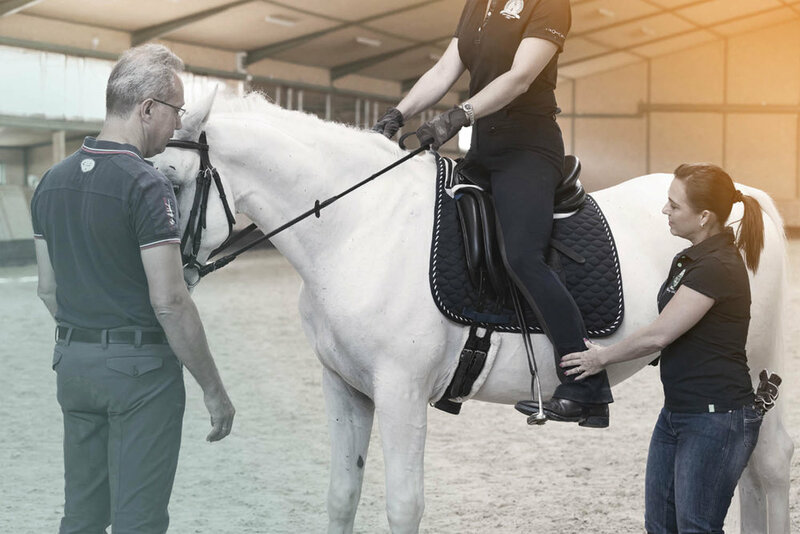 We give you the tools to understand the what, the why, and the how.We live in Germany where we work with riders of all skill levels, all disciplines, and all types of horses. We have taught throughout USA, Canada, Germany, Austria, The Netherlands, and Switzerland. We have published two books on dressage, one based on biomechanics and the other about the work on the longrein. Have a sincere heartfelt desire to learn to ride well. Their horse’s happiness and well-being is the highest priority. They are THINKING RIDERS. They want to know the why and the how. The nuts and bolts. They want to know how it all WORKS and how it all works together. We have worked with hundreds or perhaps even thousands (I am really, frankly, not sure of the count at this point) of students and horses with a myriad of issues, from highly talented to highly untalented. It doesn’t matter. Because the methods we have developed work. They work for all horses and all riders. Across the board. All breeds, other disciplines, it doesn’t matter. By systematically learning the components, you can UNDERSTAND them. Then you can USE them and build upon them. You learn that there are three toolboxes you have to influence the horse: your seat/aids, the movements, and the patterns/exercises. You learn how best to sit on your horse and how to use your seat to HELP your horse. You learn how to use and control your body. You learn how to develop your core strength and suppleness. You learn how and why the rider's aids work on the horse's body. You learn how and when to apply them. You learn how to trouble-shoot when the aids don't "go through" and what you can do about it. When you approach exercises creatively, you learn that exercises can consist of and infinite variety combinations of turns, transitions, and movements. You learn how the exercises you ride can systematically develop both the horse's body and his intellect / understanding. You learn how to USE exercises strategically to address the core issues you or your horse have. You learn how to use exercises to introduce concepts to the horse so that they come easily and stress-free to him. You learn how to choose the right exercises for each situation. You learn a wide repertoire of exercises and you then even learn how to modify and customize the exercises to better suit your horse's needs in the moment. You learn how the movements are actually TOOLS to gymnastically develop your horse. You learn about how they influence the horse. You learn how to train the movements so they make sense to you and your horse. You learn how to use the movements to develop the horse's strength, suppleness, balance, and to bring out the beauty of his gaits. Everyone says that the big magic is made by working on the basics, and THIS IS TRUE. But the truth that no one tells you is that the BASICS are NOT the endless boring circles seemingly for years on end. The real basics are these key essential components. Knowing these and being able to use them like the painter uses her brushes is what turns your riding into art. Perhaps an art in progress, but art nonetheless. THIS is where the real BIG MAGIC lives. And that is where we come in. This is our calling. To help riders like YOU learn a kinder, smarter way of working with your horse. To give riders the tools they need to develop their riding and their horses themselves. To help riders learn how to learn, to tap into their intuition, and to develop their feel. To help riders discover the "rider wisdom" within themselves. To empower riders to take control over their learning and their riding journey. To help them help themselves.